Sheikh Kaleem grasps my hand and smiles when I ask him what impact his blindness has had on his faith. He’s wearing a pearl white turban and hunches foward in the noisy room as I lean towards him to hear better. The sheikh is an active imam in several mosques in the Milwaukee area and has also taught kung fu for over 30 years. During that time, he said his students have never lost a tournament. Both the sheikh and his wife are blind. The sheikh worked as a visual artist and lost his vision in the early 1990s from excessive exposure to art chemicals. 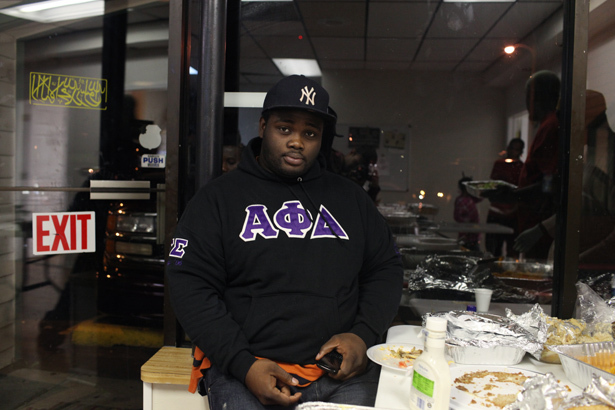 His wife lost hers recently to a battle with sickle cell. But neither of them make much of their blindness. There are over 15,000 Muslims in Milwaukee today, but when Sheikh Kaleem was a child in the 1960s, there may have been only 3-4 Muslim families in the area and no mosque. “I still remember being a child and we’d pray Friday prayer inside someone’s living room,” he said. 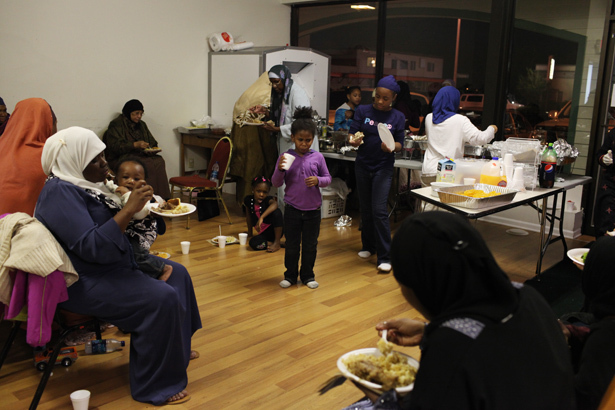 The Muslim community here is rapidly growing thanks to some of the work the Da’wa Center has been doing. One of the crown jewels of this center is its outreach to prison inmates and transitioning them to a better life once they get out. 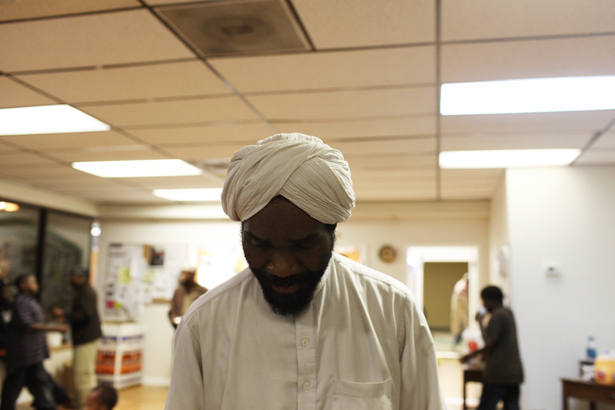 Imam Zakaria is an imam at the mosque and a Muslim chaplain in the state’s correctional facilities. He said one of the ongoing issues for the mosque here is reaching out to ex-cons who begin slipping back into their old habits after they get out of prison. 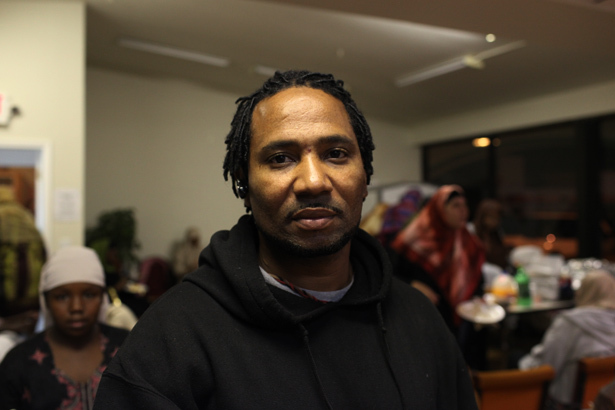 “I’ll see a brother at the Da’wa Center and a week later I’ll see him locked up again inside one of the prisons,” he said as he shakes his head. What I like about the Da’wa Center is there are very few people who simply come here to worship. Each of them are plugged into the community trying to better the people around them. A man named Hashim chats with me at length about this subject and how we as Muslims have been neglecting the social service aspect of our religion. “We spend so much time taking care of minarets and domes on our mosques that we don’t take care of our people on the streets,” he said. The Da’wa Center’s roots go back to the 1980s when a few Muslims set up an Islamic hotline that anyone could call for answers about Islam. One guy running a grocery store set up a phone line at his job that people around the neighborhood could call with questions about Islam. After work, the calls would be forwarded to his home, sort of like a 24 hour Islamic hotline. In the mid 1990s, the actual Da’wa Center was established and has been growing ever since. Sheikh Kaleem says he has to run to lead prayer at another mosque. Before he leaves, he puts his hand on my shoulder and asks me to look around the room as everyone was eating dinner. Sheikh Kaleem grabs his robe and walking stick and gives me his salams. I hand him a 30 Mosques business card and he rubs his fingers over it and smiles. 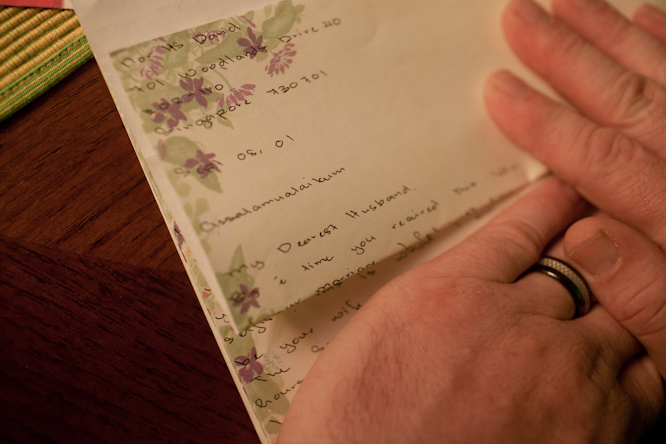 “I sense there’s something really special about you,” he said as he put the card in his shirt pocket. No disrespect, but Islam has been in Milwaukee since the 1930’s (NOI), even by “Orthodox” muslim standards, since the mid-seventies. I don’t think the author of this blog was stating that Islam didn’t “make its way” to Milwaukee until the 1980s. He wrote that the Dawa Center’s history began in that decade. Sheikh Kaleem himself recalled a time when there were only three or four Muslim families in the city and having to pray in someone’s house. THAT WAS IN THE 1960s. ASA, the Sheikh was making more of a statement on the Aqeeda of the other Muslims in the city than about the population of people who called themselves “Muslims” at the time. The oldest mosque in Milwaukee is Masjid Sultan Muhammad. The omission by others is a slap in the face to pioneers who went to jail so people could say As Salaam Alaikum! Its seems like some of the African American managed to save there religion,or able to find there roots back to Islam, after being through a ugly and inhuman slavery by ignorant and uncivilized whites of an early American era.MashaAllah” these peoples are the heroes of Islam in America.May Allah bless them for there continuous effort in there mission. Good post guys stay safe and healthy. Good luck on remaining mission. You make it sound as if Islam was the religion of all Africans that were sent into slavery, and that is quite inaccurate. Many millions of slaves came from animist backgrounds, and many of these animists were sold into slavery by the Hausa, a Muslim African group. While Islam was the religion of some slaves, more often it was the religion of the people who sold them to the European ship owners. Mistreatment of our fellow humans is, sadly, found in the history, and all too often, the current news, of all peoples and creeds. Logan your statement lacks basis particularly in reference to the Hausa, firstly there are many sub-Hausa tribes, so which one do you make reference to? Secondly the Hausa were originally a Nomadic people who have been found in regions as far away from west Africa and central Africa as modern day Sudan (Darfur). So again which particular branch are you referencing? So would you now like to be specific in your condemnation of this tribe? Are you serious? The African slave trade was invented by the Arabs CENTURIES before Europeans even landed on the African continent. Try reading a history book first. (Start with “Arab Slave Trade” in Wikipedia and go from there. You will be shocked, and, hopefully, disgusted.) Thanks for demonstrating that racist stupidity is not restricted just to white people. I implied no condemnation. As I pointed out, such things are in the histories of all peoples, mine included – both as slaves and owners of slaves. As Dave points out, a quick review of history will quickly show that several Muslim north African groups were heavily involved in the slave trade. Many point specifically to the Hausa, and no, sub-tribes are not specified. You take offense where none is offered. If you are from a people who have never abused another, then good for you. I am not. Apologies, my reply was to Diliwar. If ownership of slaves makes your ancestors “ignorant and uncivilized”, well, mirror, meet Diliwar, Diliwar, meet mirror. Yeah you might want to keep that mirror cuz I’m fairly sure he’s of Indian descent. Not that it matters. Just didn’t like your attitude. 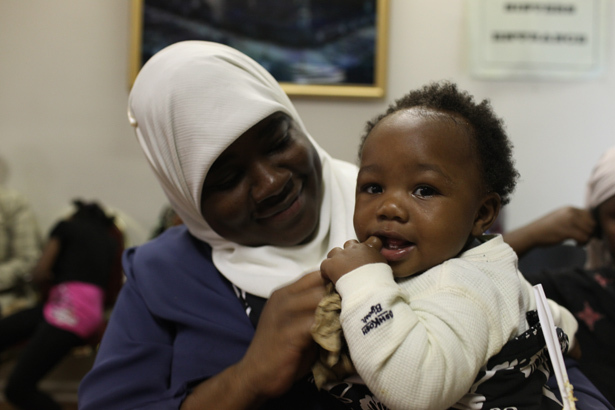 I greatly admire the African American Muslim community for its focus on social services and justice. May God bless them and their efforts. Maybe each community’s focus reflects its struggle – the mosques and the minarets, as one brother put it, might be indicative of how immigrant communities have tried so hard to preserve their identities while representing themselves in the American landscape. 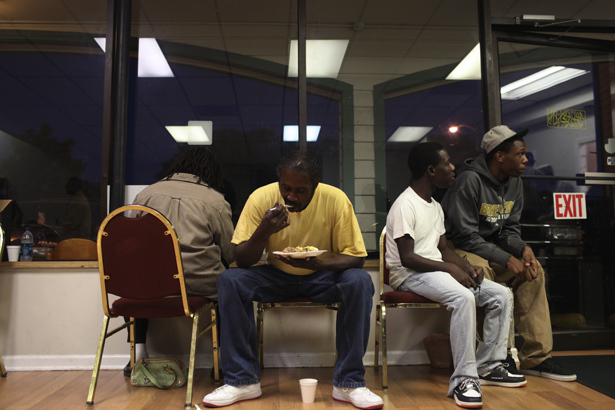 The African Americans’ concern for social services could reflect their historic struggle with inequality and a sense that they have to take care of each other. Subhanallah America provides a fascinating study of Muslim communities. Thanks for contributing your part through this website. It’s refreshing to see a community that helps those who need it most. Upward-thinking upper-class Muslim communities seem too ivory-tower-centered sometimes, losing touch with zakat, a pillar that is in fact as important as the other four. I am so happy to see this community’s focus on dawah and helping out the community. 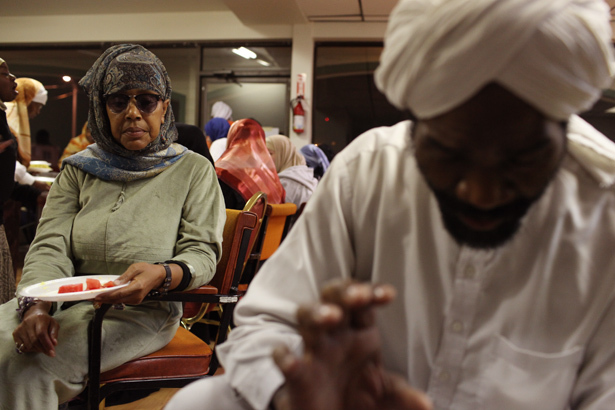 I’ve been to a mosque in Detroit with African American muslims and I’ve never felt so comfortable and welcomed in any other mosque in Canada, than I did there. your posts for each day has been a total eye-opening experience for me and i thank you guys for that (because i’m from singapore…haha). looking forward to more heartfelt, awe-inspiring posts! Salaam alaikum wr hb.thanks for going on this road trip…you have provided me with insight on the Muslim way of life in the U.S of A. jazakallahu khayran! 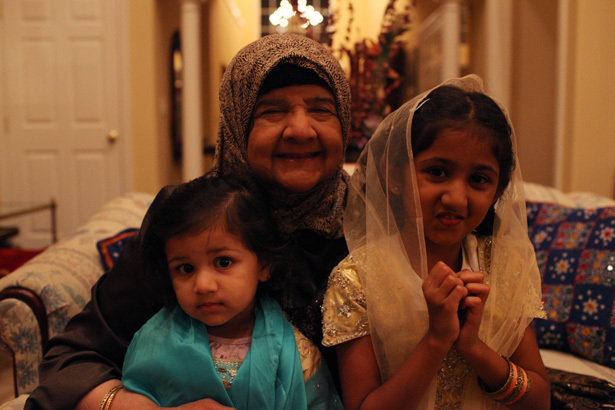 Thank you so much for sharing these glimpses of Muslim life around the United States. I love being able to encounter these places and these people through your eyes. Salaam aleikum and many blessings to y’all! His perception of blindness is very inspiring. I am wow-ed. Also, You guys are in Milwaukee!!? So close to Canada!!! Have you seen The Color of Paradise? You might enjoy that. I wish our muslim center is like this. We live at the border of Wisconsin and Illinois, wish to visit this Da’wa Center someday and hope to see the Imam. What a wonderful man! What can I say except, “I love this blog”! Your journey is the epitome of true brotherhood! Wow. This one gave me chills. shaikh kaleem probably sees more than those of us who are not blind.your eyes can be wide open and you will not see the truth.see for example how in mediatation which you do to find the truth,you close eyes as if blind.he is in less distraction daily and in more remembrances(mediatation). you guys are wonderful,keep being wonderful. ASA. I continue to enjoy your blog everytime I log on to it! As to those who try to negate what you brothers in the faith are doing, go the haters blog. There are enough of them around to continue your discussion on who was or who was not involved in the slave trade! Furthermore, African centric folks would have you believe that Africans, Animists were not collaborators with white slavers and that’s not true! Everyone was involved! Masalaams. I remember I met this Shaykh when he visited Miami a few years ago. He really had an impact on me. You are racist yourselves. Read between the lines. I`ve happened to be getting コーチ all of my daily life!! They can be favored together with great. Plaus these are generally particularly fashionable like several the girls inside my the school produce コーチ. I’ll state alittle pricy, but it can be worth their expense for me.